President Trump wants to carve out a cool $3.6 billion from the the Pentagon's military construction budget to pay for his long-promised border wall. And this week Congress got its first look at the upgrades that could be delayed on bases to free up those billions of dollars. The 21-page list set elected officials' hands wringing across the country. Big ticket items that may now be put on hold include: airplane hangars, hospitals, waste treatment facilities, and fire stations. Here in Southern California, a unit often called upon to help fight wildfires awaits the fate of flight simulator critical for training pilots. The Air National Guard Station at Channel Islands is home to the 146th Airlift Wing. The 146th has been expecting a new $8 million C-130J flight simulator. But that funding is now in doubt. It comes down to timing. The contract for the flight simulator is due to be awarded after a self-imposed Pentagon cutoff date — and that makes the project vulnerable. In a statement accompanying the list, the DoD said it will pull funding only from projects with award dates after Sept. 30, 2019. The 146th's flight simulator project isn't due to be funded until July 2020. California pilots now have to travel to the East Coast to train on a C-130J simulator, said Lt. Col. Tom Keegan, public affairs officer for the California National Guard. That's why a simulator is needed out West. "Having a simulator on the West Coast would allow these folks to do emergency procedure training that wouldn't have to be done in the jets themselves," Keegan said. "It would reduce costs and would allow for much more repetition of training exercises." The pilots of the 146th use C-130J aircraft specially outfitted to fight fires. 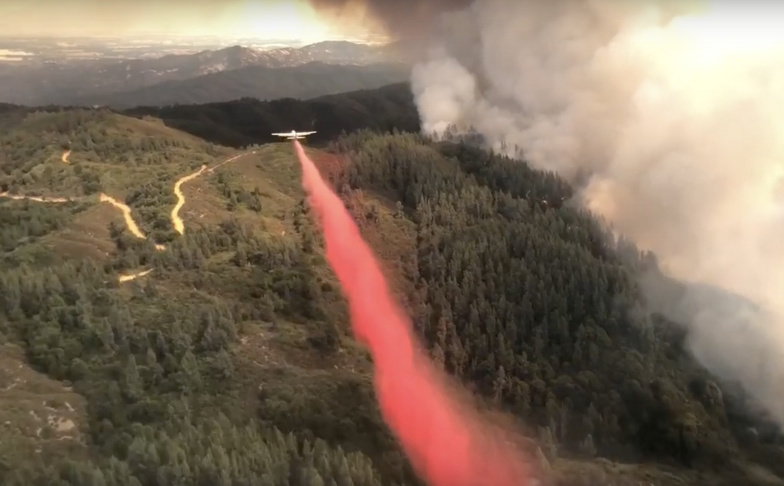 The planes are equipped to drop thousands of gallons of bright-red Phos-Chek fire retardant onto hotspots. "[The C-130J simulator] definitely helps with readiness. We look forward to it coming," Keegan said. "If it's delayed, that would be too bad. But we're hopeful." The 146th Airlift Wing activated in November to help CalFire contain the Woolsey Fire. White House and defense officials have said projects that have funding diverted to the wall will not be canceled, just pushed back. It's not clear if they will be first in line for the next round of appropriations. There are many more Southern California projects on the Pentagon's list, but most are expected to move forward because they're far enough along in the construction pipeline to avoid the border wall carve-out. Such projects that appear to be on track include training and medical facilities at the Marine Corp's Camp Pendleton, north of San Diego, and landing pad and security upgrades at Marine Corps Air Station Miramar. The Navy is prepping for a lot of construction on Coronado Island, and expecting funding to replace a pier in San Diego to the tune of $49 million dollars. These are projects Congress has already approved, but the Department of Defense has yet to award the contracts. Closer to L.A., there are a couple upgrades planned for the Naval Weapons Station in Seal Beach. The biggest is a new causeway, boat channel and turning basin for $118 million bucks. Naval Air Station Pt. Mugu is making plans for a new energy systems lab with a $22 million price tag. In northern San Bernardino County, in the Mojave Desert, new construction is expected at the Army's Fort Irwin, home to the National Training Center for all the armed forces. Fort Irwin is in line for a $29 million "Multipurpose Range Complex" and land acquisition. It's notable that the Pentagon has exempted military barracks, family housing, and dormitory construction from cuts. Newsroom investigations, a survey, and Congressional hearings recently exposed substandard and sometimes dangerous living conditions for military families on base. Mold, rats, bad wiring and terrible plumbing were just some of the complaints. DoD made clear in its release this week that no funding for housing upgrades will go to the President's border wall. The House Armed Services Committee plans to hold hearings on how military readiness will be impacted when funding is diverted away from base facility upgrades to the border wall construction. Conflict over border wall funding led to the longest partial federal government shutdown in history, starting in December. President Trump later backed off the budget showdown with Congress, and instead declared a state of emergency. The White House argues the move allows Trump to pull funding from military construction to pay for the wall. But Trump's emergency declaration has faced sharp critics. Two members of the House committee shared their assessment with KPCC/LAist, following the Pentagon's announcement. "The President is using his fake emergency in order to circumvent the Constitution and Congress to illegally fund his pet project border wall," said Orange County congressman Gil Cisneros, a Democrat and Navy veteran. "Department of Defense officials have testified to me that the President's plan of action would negatively affect military readiness, our bases, and our service members and their families." Fellow Democratic Katie Hill, who is also in her first term, called the President's maneuver, "outrageous." "Any pull of military funding from California that has already been authorized and appropriated — like Camp Pendleton and Fort Irwin — is a hit to us all," said Hill, who represents areas in north L.A. County, including Santa Clarita and Palmdale. Rep. Paul Cook, a Marine Corps veteran and Republican member of the Armed Services Committee, did not respond to a request for comment. His district includes Fort Irwin in San Bernardino County. The House and Senate will have another chance to vote on the state of emergency next week. It's unlikely they will meet the two-thirds threshold to override a presidential veto. One thing to keep in mind: Many members of Congress are now facing the loss of big chunks of military construction money. That includes many Republicans, opening the door for more GOP votes against the president.